I was giving a little more thought to the cooler gift idea (see prior post on Classic Stainless Steel Cooler), which I like by the way. I was thinking that many people have more than one cooler. Often a different size and shape cooler for different occasions and requirements. Anyway, we wanted to provide some additional cooler gift ideas @ Amazon.com ! 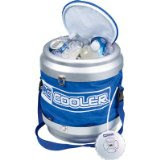 PS Check out this cool, radio-controlled cooler @ Amazon.com shown in the picture above.